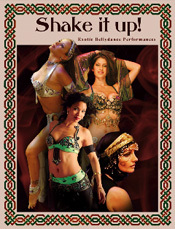 A Presentation of Mesmerizing Perfomances From an All-Star Cast of Dancers Who Perform Diverse Styles of Bellydance From Traditional to Modern, and Folkloric to Fusion. Featuring Jamileh, Ansuya, Adam Basma Dance Co., Virginia, Kaya, Sohaila, Sadie, and Many More! 5. Adam Basma Dance Co. "Ala Dalona"
10. Sohaila "Abart Al Shat"